below is the link to my coverage of ICEBERG’s show on Day 1, text is highlighted below! ICEBERG began this season at the main BFC show space with a bang as we saw an effortlessly cool streetwear collection resplendent in bold colours and compelling prints storm down the runway. Silhouettes were minimalistic and casual with zip-up sports jackets and loose-fitting sweatshirts taking centre stage. Simple colour-block looks were juxtaposed against busy triple-printed denim and sparkling monochromatic pieces. 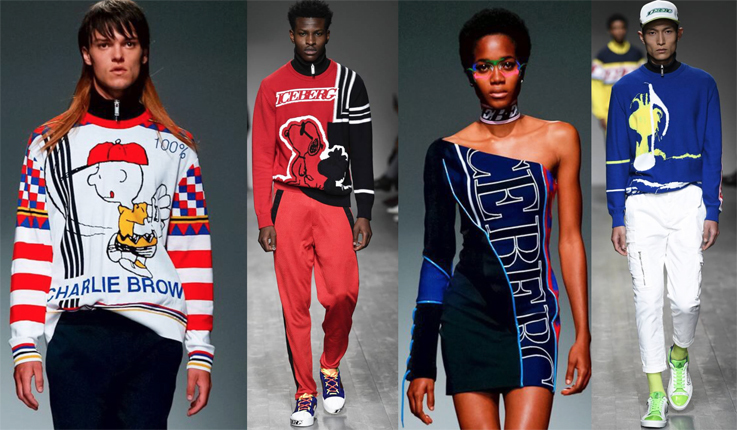 Graphic ICEBERG logos were used throughout, branding tops and bottoms alike and in some cases being used as the basis of a print for coordinating sets. 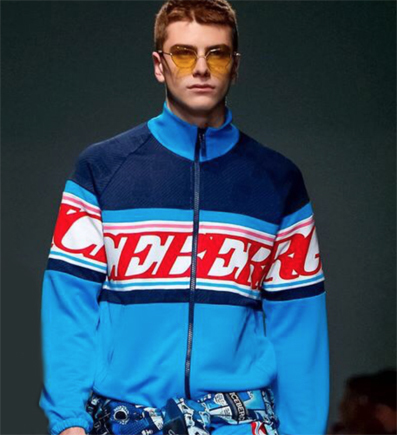 Pushing forward a flashy sportswear aesthetic, we witnessed the sleekness of Formula 1 combined with the brashness of Italo pop. Colours were blindingly bright and reminiscent of sports drinks and the Italian flag with greens, reds, yellows, and blues making appearances. The Pink Panther and characters from Peanuts were also featured, adding a sense of fun nostalgia to this modern collection. One of my favourite moments was a pink tracksuit which had ICEBERG stamped across the chest but unexpectedly had the Pink Panther’s face emblazoned across the entire back. So much love for such an iconic look!